Objective: To compare accelerometer inter-device variability and to evaluate the effect of canine collar tightness on activity counts. 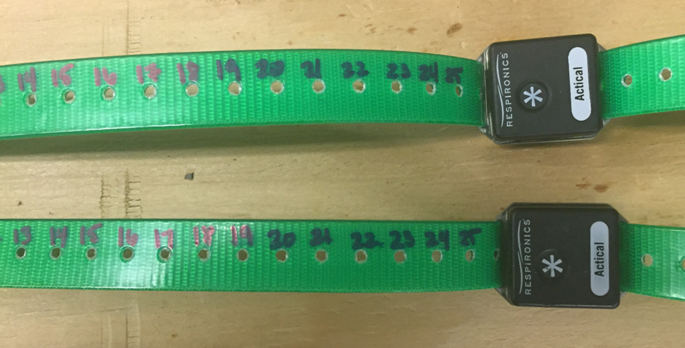 Evidentiary value: This is a prospective study of six dogs wearing Actical accelerometers over 24 hours with variable placement to evaluate accelerometer inter-device variability and collar tightness. Methods: Six skeletally mature medium to large breed client-owned dogs were enrolled in the study. Twelve identical accelerometer devices were used, with the same two devices used for each dog. All accelerometers were placed on the ventral cervical region. A total of four placement patterns (P1: two accelerometers on the same collar; P2: two separate collars with same tightness with one accelerometer on each collar; P3 & P4: one collar loose/one collar tight and one accelerometer on each collar) were evaluated. Pearson’s correlation, paired t-tests, and percent of variation between total activity counts for each placement period were calculated. Results: For P1-P4, Pearson’s correlation was 0.92, 0.95, 0.93, and 0.86 (p<0.0001 for all comparisons). For P1-P4, t-ratio was -20.59 (p<0.0001), 9.78 (p<0.0001), -8.95 (p<0.0001), and -2.15 (p<0.0313), respectively. When evaluating inter-device variability, the percent differences between total activity counts of device pairs ranged from 2.5 to 56.8%. Conclusion: While the correlations between devices for all placements were high, the high inter-device variability shows that further investigation is necessary. From this study, the results suggest that changing devices throughout a study should be avoided. We recommend that attachment of the accelerometers to the collar, including collar tightness, should be kept consistent until further studies are available. Application: When accelerometer data are used for objective outcomes, accelerometer inter-device variability and collar tightness should be taken into account. Mini Mitter, (2008) Actical Instruction Manual Version 2.12. pp. 1-6.